To save your time I have made a quick video which will help you fix Something went wrong error in two easy ways. Don’t want to watch? Then follow the awesome article below. 4 ways to fix “something went wrong!” problem in Hotspot Shield. Hotspot Shield is one of the popular VPN software available to download for free. The software is available for desktops and mobile phones. The free version shows ads while you browse but the full version does not, and you can select any region from over twenty regions available. With every software, there are issues, and Hotspot Shield has one. 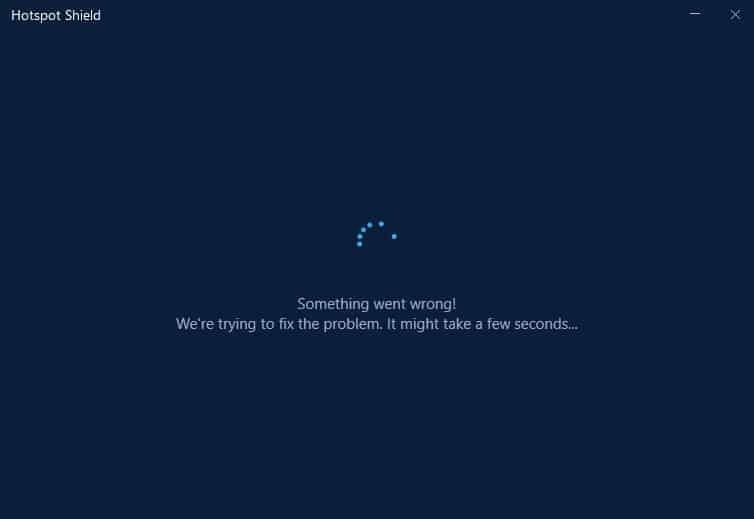 The message which pops up when you start Hotspot Shield “Something went wrong!”. The bottom line might be different depending on the version and the error, but for most of these errors there are four solutions, and I’ll explain both solutions in this article with images and a video. If you are interested in video, then scroll down the end to find the video otherwise, follow the article. The first and easiest way is to end the task in Task Manager. Follow the steps below to fix the issue. Right Click on Task Bar and open the Task Manager. 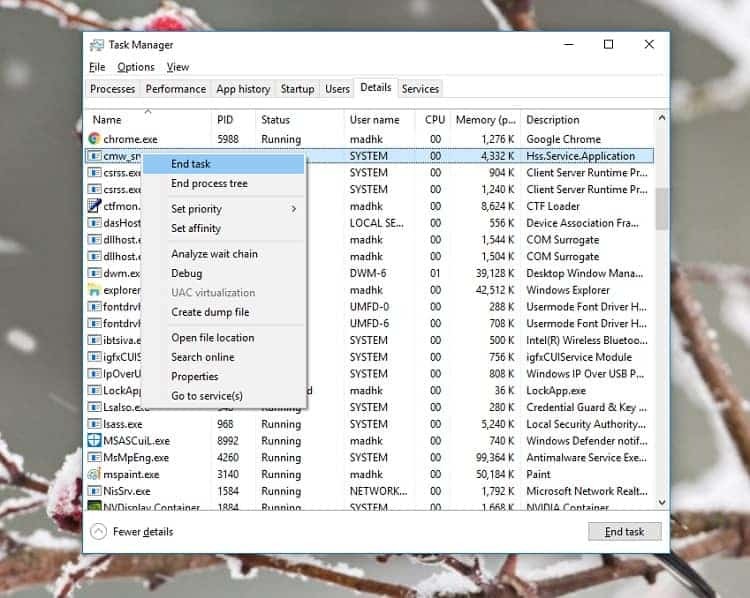 You can also open the task manager by pressing Ctrl + Alt + Delete at the same time. Go to Details and search for “cmw_srv.exe”. You can press C to find the tasks starting with C. Anyway if you find the task then continue otherwise, go to method 2. Once found right click on the task and you’ll see the menu something like below. Click on End Task and a pop up will come on the screen. Click on “End Process” and close Task Manager. Try opening Hotspot Shield and hopefully the error will not come again. hshld is a service by Hotspot Shield. You can see “Hotspot Shield Service” in the description menu. For any reason, if you could not find cme_srv.exe or the above method did not work, then this would work. I always fix the issue with this method. 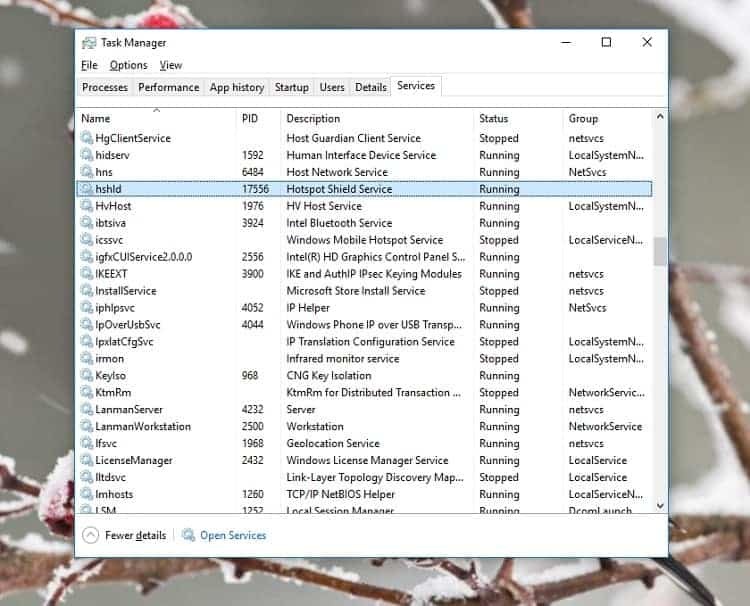 Open Task Manager by right-clicking on Task Bar. This time we will go to the Services tab. In the Services tab to make life easier click on Name column to sort the services alphabetically. Press H key to find hshld service. It would look something like the below image. To fix “something went wrong error we have to stop the service (if running) and then start it again. To do that, we must right click on the service and click on “Stop” if already on start and click on “Start” if already on stop. You must start the service again after stopping it. The third one is a straightforward method. Try restarting the PC. In most of the cases, one of the above fixes the issue, but if not then there might be some issue with your PC. Try restarting the PC. Close Hotspot Shield and try rebooting. If it worked then excellent otherwise, a tip might get it to work is clicking on “start on startup” in the Hotspot Shield settings menu and try restarting your PC. Check out: 10 Must have Android Apps in 2019. If restarting the PC did not work then try uninstalling Hotspot Shield. Reinstalling is our last hope, and it will not take enough time to do that. Follow the steps to successfully reinstall Hotspot Shield. Before doing anything make sure you have your account details saved or remembered if you are using the Elite version. Go to the website to download Hotspot Shield. Make sure to download the original software from the download page. Open Control Panel. You can search the Control Panel in the search bar on Windows 10. Select “Category” on the top right corner and then click on “Uninstall a program”. You will see something like below image. Find Hotspot Shield. Right or double click on Hotspot Shield to uninstall and follow the steps to uninstall the software. Once done, open the downloaded Hotspot Shield and try opening. Hopefully reinstalling would fix the issue. If none of the above methods worked then, the version might not be the best for your PC, or there might be a different issue. You can contact their team with all the details, and hopefully, they would be able to fix that for you. I hope the article helped. Please put the comments below if any of the methods worked so everyone can get benefits.